Our agency runs smoothy with the help of dedicated leadership. Our chief, division deputy chiefs, and administrative officers work tirelessly to make sure our membership has the resources it needs to effectively serve the community. Like our general membership, they receive no monetary compensation for their dedicated service. We have recently implemented a new organizational structure that is better suited to the various operational and administrative roles within our system. The Chief of Blacksburg Volunteer Rescue Squad oversees the four divisions that we are comprised of: Field Operations, EMS Operations, Special Operations, and Support. Each division is supervised by a deputy chief, and is assigned the appropriate support roles and resources needed to carry out its assignments. Field Operations Division: This division consists of the field supervisors, who oversee all daily operations of the squad. The field supervisors have a background in EMS and technical rescue operations in addition to specific training in incident command and scene management. If a complex incident occurs or a duty crew needs assistance, the field supervisor is immediately available to assist and coordinate additional resources. EMS Operations Division: This division is responsible for the delivery of all emergency medical care, which is a core function of Blacksburg Rescue. All EMS personnel are trained to national standards and practice through the license of operational medical directors, who are physicians with special training and understanding of the prehospital medical environment. Special Operations Division: One of the unique features of being a rescue squad is that we respond to so much more than just EMS calls. Our Special Operations Division trains and responds for lower-frequency, high-acuity emergencies including vehicle wrecks, high-angle rescue, confined space and trench rescue, water rescue, wilderness search and rescue, and cave rescue. 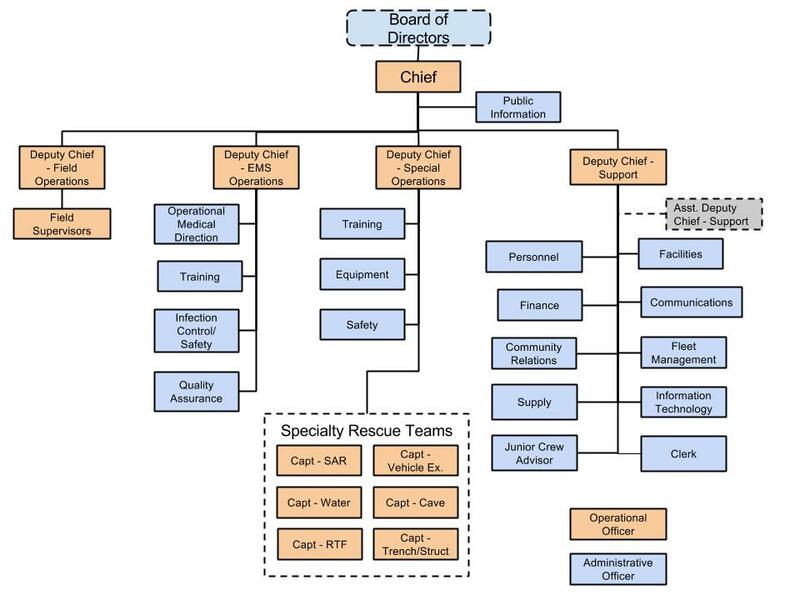 Each speciality discipline operates as a team and incorporates into the command structure of Blacksburg Rescue. Support Division: It takes a lot of moving parts to keep any organization running. The Support Division encompasses many of the general functions that are needed to help perpetuate the other divisions. This structure allows us to better utilize our members with diverse backgrounds in human resources, supply chain management, and other business operations in order to help our entire organization function more efficiently.